As a graduate student at Seton Hill University you will enjoy an environment designed for working adults, including programs offered online, on campus or both. Whether you are an experienced professional or a recent college graduate, a graduate degree from Seton Hill will help you take charge of your future. Fill out an easy online Request for Information form. View a full list of Seton Hill University Graduate Programs below. 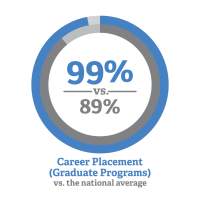 You don't need to take the GMAT or GRE to be admitted into any of our graduate programs. We offer competitive tuition, aid and an easy payment plan. A team of professionals is ready to help you through the admission process - and will also be available throughout your academic journey to help with anything you need. Faculty who have worked in their fields of expertise will work with you one-on-one to support your learning and career goals. Seton Hill's award-winning Career and Professional Development Center is here for you as a student, and whenever you need it after you graduate. Feel free to contact anyone on the Admissions Team. Fill out our Request for Information form. Call (724) 838-4208 or (800) 826-6234 toll free. If you are inquiring about our Physician Assistant Program, please call (724) 552-4355. Take a look at our Graduate Program Admission Requirements.